I haven't posted in forever! I needed to get back online, so I found inspiration in Fab Friday's color challenge and my new stamp set, Share What You Love. 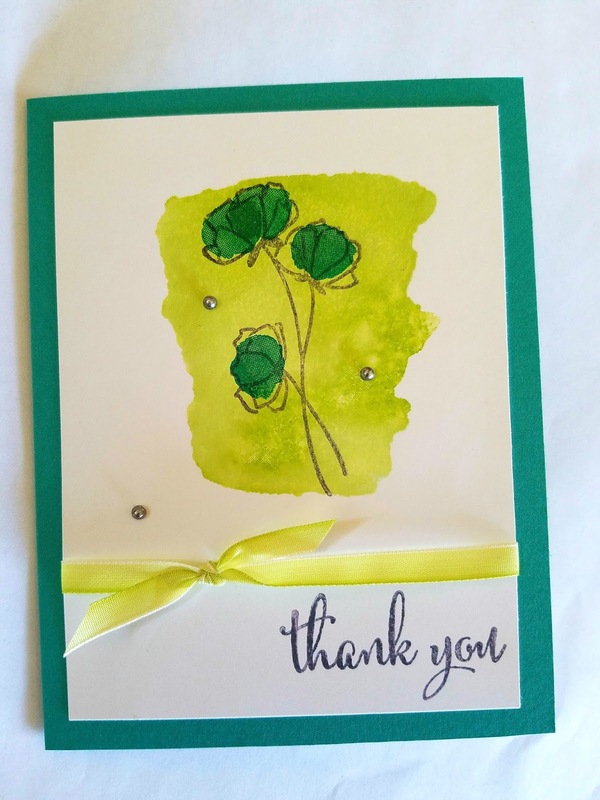 The card base is Bermuda Bay, and I stamped the flower centers in that color too. The sentiment and flower image is Basic Gray. I colored the pearls with my dark Smoky Slate blend marker. 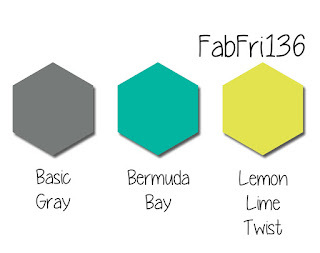 Lemon Lime Twist pops in the background and ribbon. 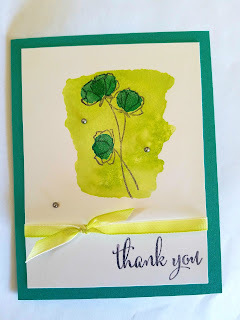 For the background, I inked up the stamp and spritzed it with water before stamping. 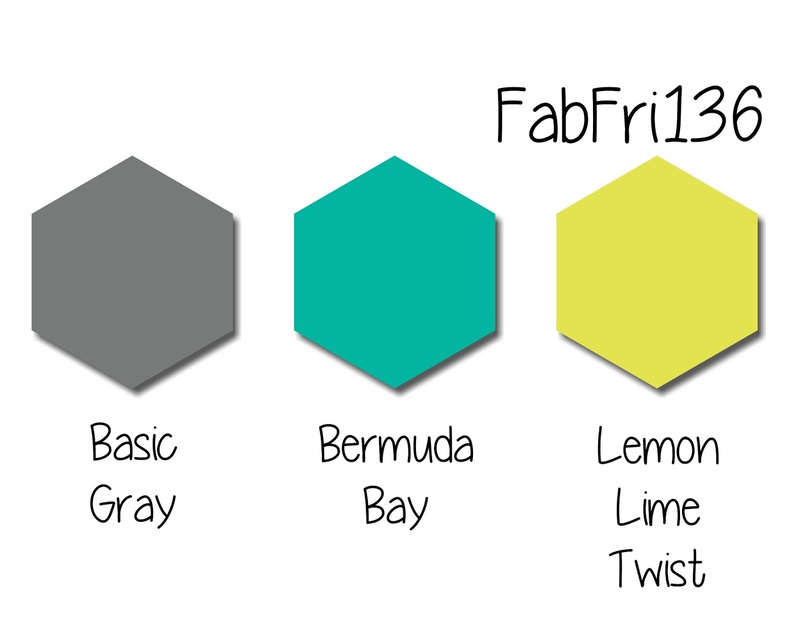 Join the Fab Friday challenges here! Here's the banner I made Krissy for her birthday using the June Paper Pumpkin kit. I love that you can personalize the banner! After she opened the card, I learned a great tip I'll share with you. 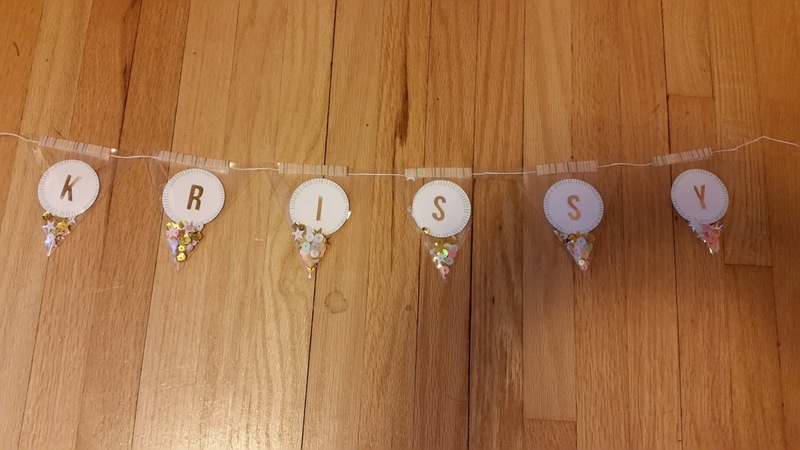 Make sure the washi tape goes all the way across each piece so the confetti doesn't come out! Sadly, I needed a sympathy card this week. 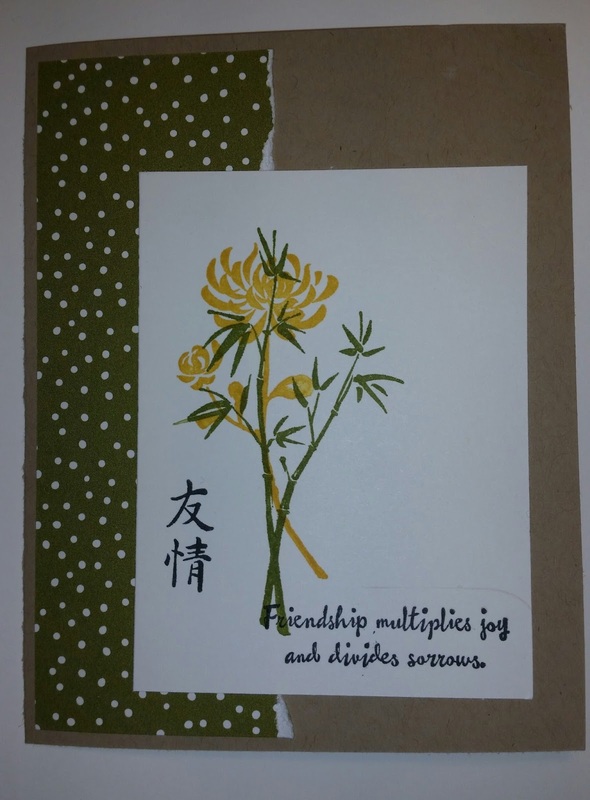 I just got Artfully Asian, and I love the sentiments in it! 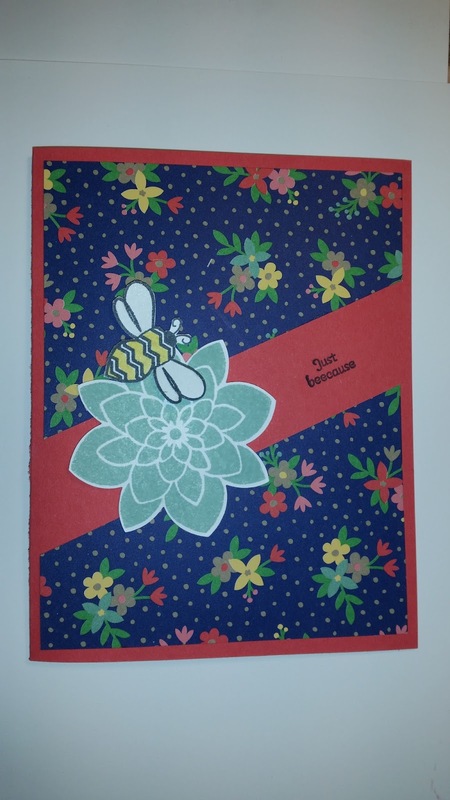 I got the idea to stamp the flower over the bamboo from one of the samples in the catalog. I got the color combination from the Serene Scenery paper stack. The card base is Crumb Cake, and the DSP is Old Olive. I cut it to 5 1/4 X 3 and then tore the edge. The focal image is on 3 X 4 Whisper White. The bamboo is stamped in Old Olive, and the flower is stamped in Crushed Curry. The sentiment and friendship symbol are stamped in black Memento. 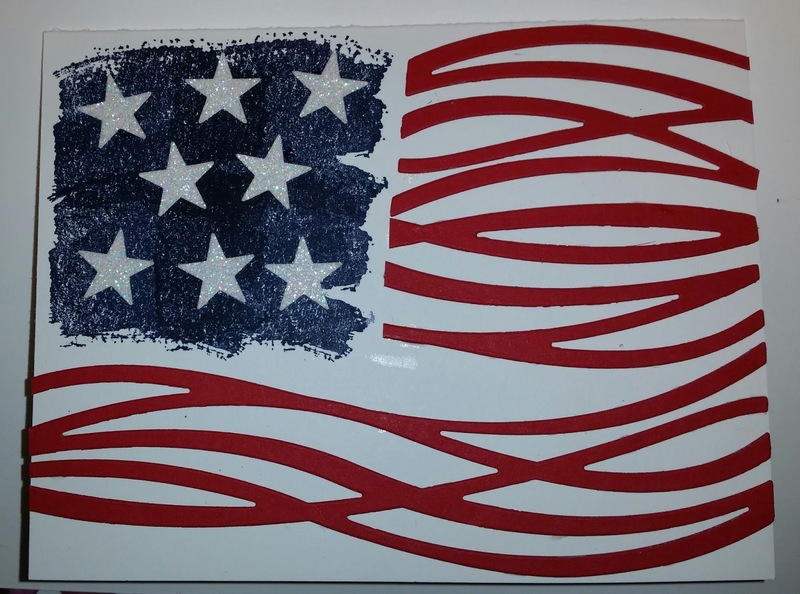 Here's my latest take on a flag card. The card base is thicker Whisper White. 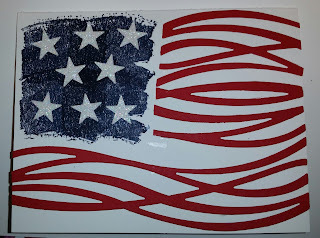 The stripes are cut out using the Big Shot and the Swirly Scribbles thinlits in Real Red. The stars are punched out of Dazzling Diamonds glimmer paper, and they're on a Night of Navy background stamped from Work of Art. Using ALL of the Paper Pumpkin! One of my favorite things about the Paper Pumpkin kits is that there are lots of leftovers! In the March kit, the cards used outlines of shapes, and all of the innards were left. I used masking tape to gently peel these stickers off the backing still in their original shapes. They're adhered to specialty DSP from Saleabration. That awesome glitter tape attaches the DSP to the card bases. The sentiments are also ftom the March kit. Happy stamping! Earlier this week, I saw this faux wax seal technique on Shelli Gardner's blog, and I knew I had to try it! You can find her excellent instructions here. I also wanted to use the gorgeous new Serene Scenery DSP stack. This stack has photorealistic images on one side of the paper and more typical DSP images on the other. So versatile! Once I saw this paper, I knew I wanted to use the starfish from Picture Perfect for the wax seal. That image is bigger than I remembered which made the technique a little trickier. When I first stamped, only part of the area was still soft enough so I got a partial image. I ended up reheating and restamping a couple more times. I love how it turned out! Since the paper and faux wax seal are so pretty, I kept the rest of the card pretty simple. The card base is Pool Party. I stamped around the edge with a splatter stamp from Gorgeous Grunge and Versamark ink. 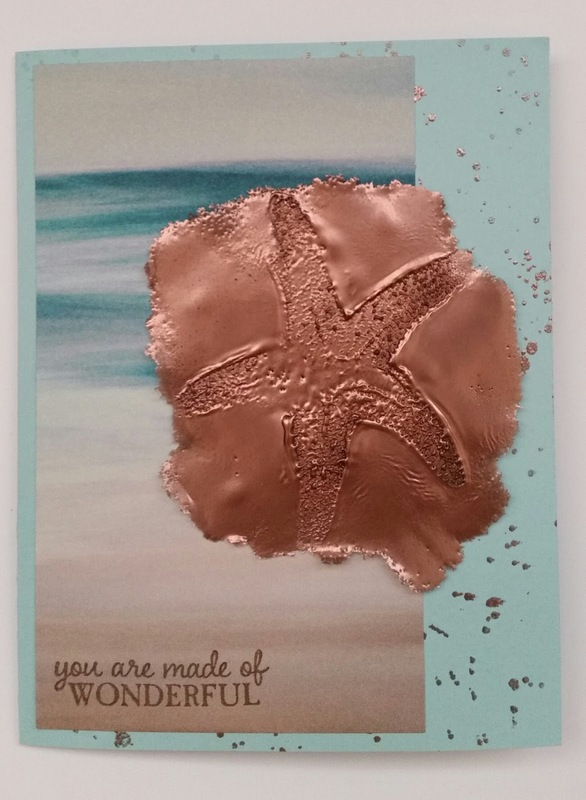 Then I poured on the copper embossing powder and heated it. The DSP was cut in half, and I trimmed 3/4 off the top. The sentiment from Picture Perfect is stamped in Soft Suede. I used mini glue dots to adhere the faux wax seal to the card base. 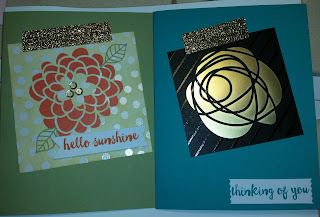 This card features new DSP, a new stamp set and a great technique! 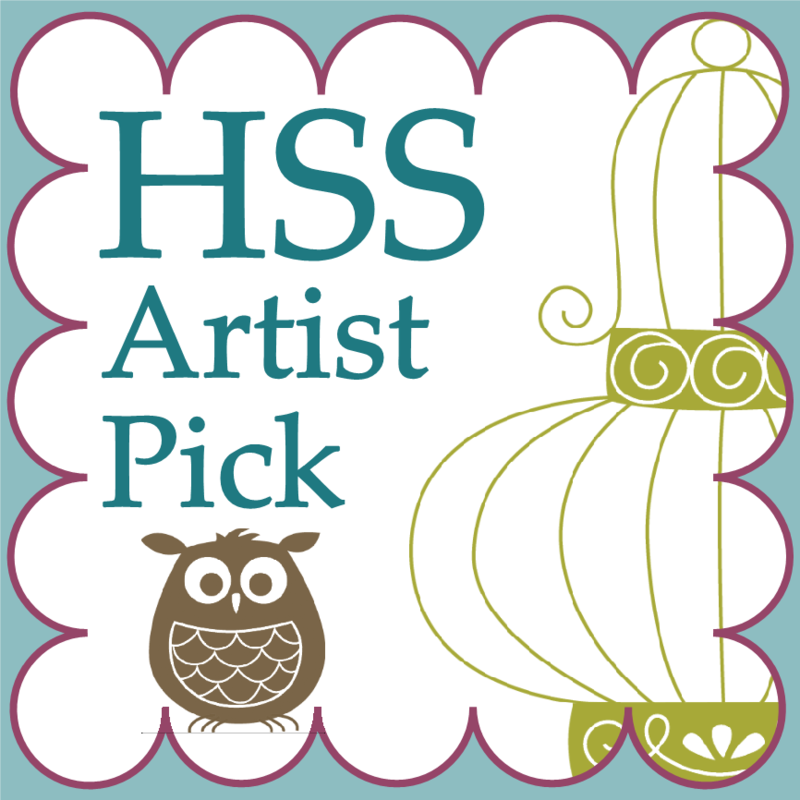 The card base is Watermelon Wonder with the new Affectionately Yours DSP. To recreate this look, cut a 4 X 4 square of DSP and then cut it on the diagonal. That means you can get 9 cards from one sheet of DSP! I stamped the flower from Crazy About You in Mint Macaron then punched it with the flower medallion punch. The bee and sentiment are from the host set Pun Intended. I HAD to get that set because my husband loves puns! After I stamped the bee in Memento black ink, I watercolored the stripes with Daffodil Delight ink and clear Wink of Stella. 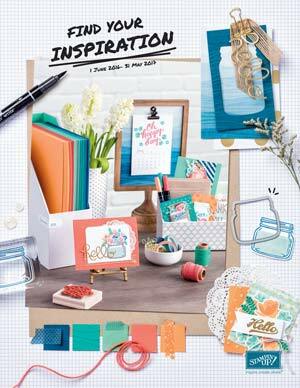 Yes, that's right, you can watercolor with Wink of Stella! It gives an awesome shimmery look! Once you're done with the color, just wipe the brush until it is clear (just like with the aquapainter). Then I added clear Wink of Stella to the wings too.